"News about Network data backup system for servers, desktops and laptops"
May 11, 2017 — Ferro Software issued the new version of its Ferro Backup System which considerably accelerates backup copy creation. 5 version features significant changes that increase the backup copy creation process speed. The biggest change was brought by the symmetric multiprocessing architecture. This technology provides e.g. almost 4-times faster backup process for 4-core CPU computer. Additionally, network protocol optimisation allows to speed up the data transmission to backup server by 1/3. The newest version offers backup and recovery of computers without sending data to backup server. This solution provide efficient computer protection within all enterprise offices integrated with the headquarters via weak network connection. Additionally, you can specify blocking or limiting the use of network connection rules based on the IP address of the incoming connection. Consequently, you can backup any mobile computer with full speed, if it's connected with backup server via LAN, but in case of connection via mobile network modem, backup can be blocked or slowed down. Another improvement is the possibility to backup and restore virtual machines running under Microsoft Hyper-V hypervisor. In addition to efficiency enhancements implemented to this version, you can instantly secure Microsoft Hyper-V and VMWare ESX(i) VMs. New Docker containers support provides great improvement for administrators of various operating systems. Ferro Backup System containers offer easy and fast launching of backup server or client under any operating system supporting that technology. Ferro Backup System container can run on any Windows, Linux or OS X work station, or NAS device (Synology, QNAP) powered by Intel x86-64 CPU. 5 edition supports the latest Microsoft operating system releases: Windows 10 and Windows Server 2016. It features e.g. hybrid sleep, quick launch and InstantGo. Other improvements of 5.0 release cover a lot of minor enhancements and fixed issues detected in the previous versions of the application. Complete list of changes is available here: Update history. 31 August 2015 – Ferro Software launched a new version of the data backup software, the Ferro Backup System 4.8, which introduces many improvements and corrects stability. Many minor improvements have been made in the 4.8 version, facilitating backup copy operators' work. A progress indicator for backup, replication, recovery and verification of backups has been added. The software now makes it possible to send administrative alerts via mail servers requiring SSL/TLS encryption (e.g. gmail) and generates a report concerning the replication status. Apart from these improvements, the latest version also introduces many changes concerning work stability. The software has been made resistant to writing errors caused by a temporary lack of access to the NAS hard drive and to errors of transmission and interruption of connections in Wi-Fi networks. Improvements have also been made to monitoring and connecting network shares. The corrections in the 4.8 version concern replication efficiency, Novell NetWare server backup, console operation in the Internet Explorer web browser and cooperation with the Windows 10 operating system. For a complete list of changes please go to Change Log page. 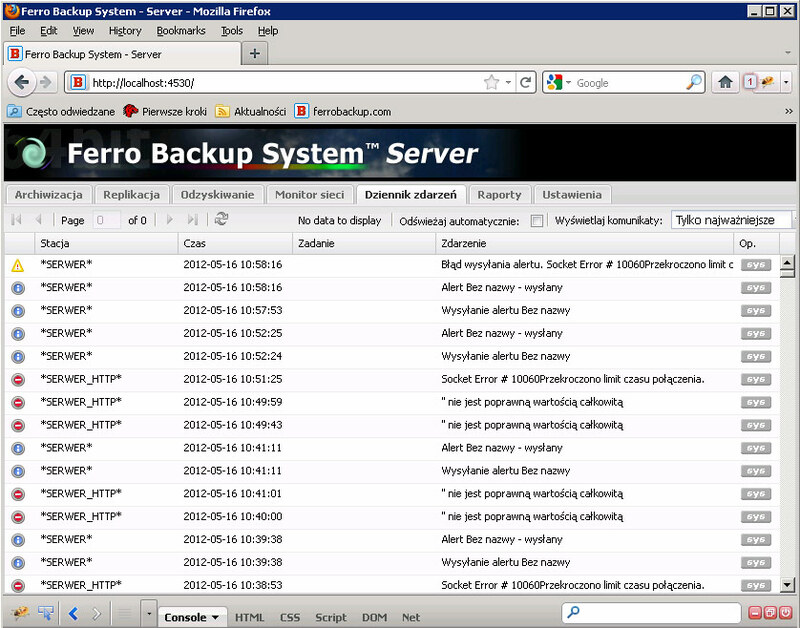 26 March 2015 - Ferro Software launched a new version of the data backup software, the Ferro Backup System 4.7, which enables to recover the disk image through the local network to the crashed computer. The new version has many improvements. One of the more important new features is the boot disk creator, which, in case of a computer failure, enables to restart it from a CD or a pendrive. The computer operating in this mode will automatically connect to the backup server, and the administrator will be able to remotely restore the entire operating system. Previously, such an operation required connecting the disk from the crashed computer to the backup server, which might cause difficulties in the case of laptop disks or server disks operating in a RAID configuration. Now, the entire procedure can be carried out easily and quickly through the LAN without opening the computer case. Version 4.7 also introduces changes in the delta backup mechanism. Such a backup copy significantly speeds up backup of large files (only the changed portions are copied) and makes backups much smaller than the typical incremental backups. In the previous versions, the first two copies were carried out automatically in a full mode, and only then could the differences at the file fragment level be calculated. In the current version, only the first copy has to be a full copy, and all the other ones just differ from one another. Also, the new version fixes several bugs that caused the necessity to carry out a full copy once again, which could lead to an increased network load. Other changes and improvements include new remote command-line mode, the possibility of using SQL queries when viewing logs and generating administrative alerts, and fixed deleting of snapshots from VMWare ESXi host after the backup is complete. Ferro Backup System is available in license packs for 5, 10, 30, 50 and 100 computers. The smallest pack costs $140, and the largest $1.200. Please go to Orders page to purchase the new version of the software. 12 January 2015 - Ferro Software issued a new version of its backup software - Ferro Backup System 4.5 - which support VMWare virtual machine backups. Version 4.5 supports backups of virtual machines running under the VMWare vSphere (ESX) hypervisor. The system performs backups of both stopped and running virtual machines. No software needs to be installed on the host or on the virtual machines. Backups are performed by a client running on any computer in the network. Backups can be full or incremental on a file fragment differential basis (delta). The newest version of the software also includes several minor fixes and upgrades. Those include mainly replication, backup verification, transmission error detection and support for the newest versions of the Mozilla Firefox and Apple Safari browsers. After almost five years, FERRO Software launched the fourth version of the network data backup system, the Ferro Backup System. Ferro Backup System 4 includes more than 20 improvements and fixes. The most important improvements concern the central control console. The new edition includes web interface, which can be accessed through an Internet browser. This improvement helps administrators manage the backup system by a remote computer or tablet. It also allows multiple administrators to use the program and offers three levels of access protection: administrator, operator and observer. Version 4 introduces tape library and autoloader support. The native service of these devices in Windows was ended with the Server 2008 R2 version. 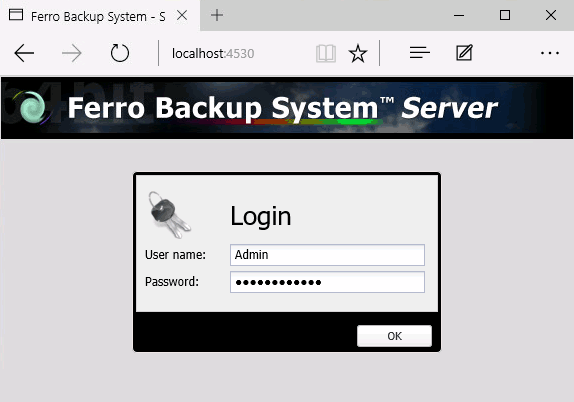 The new Ferro Backup System supports streamers in all Windows versions, including the latest Windows Server 2012 and Windows 8.1. Other improvements concern the presentation layer of backup tasks, reports and new administrative alerts. The new version also provides improved efficiency and stability of the backup server. The installation package has been reduces from 4.1 MB to 1.8 MB. Ferro Backup System works in the client/server architecture and allows to protect computers connected to the computer network. Backup may include files and directories or entire hard disk drives. In case of breakdown, it enables to recover backup data and the operating system with installed programs. The change from a traditional Win32 GUI to a web interface requires a lot of time and effort. Despite all this, we would like to keep the new interface similar to the old, at least in the beginning, to facilitate migration for current users. Below are a few screenshots of the new interface. 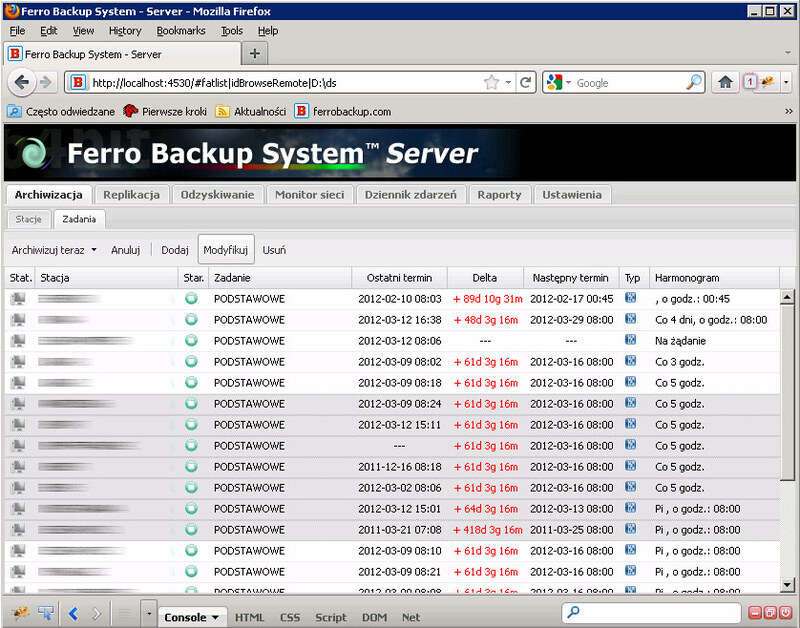 16 August 2011 - FERRO Software launched a new version of the network data backup system, the Ferro Backup System. In version 3.5, one of the most important program components responsible for backup of open and locked files has been redesigned and re-implemented. Previously, when executing backup copies of large files, such as mail client files, database files or virtual machine files, the program would suspend the save to disk process to obtain a consistent copy. In the new version, the program uses copy on write technology, which allows a coherent file image to be created without suspending the process. A driver has been built specially for this solution, which, upon detecting a write operation, reads primary data from the disk and then allows new data to be written. This way the program using the file can continue to run smoothly, while the Ferro Backup System is conducting backup. The unique advantage of this solution is that it is totally independent of the VSS service, requires no extra disk space and does not reduce the operating system's efficiency. The reason is that the driver responsible for copy on write is dynamically installed only when needed, and data copies are sent directly to the backup server. Consequently, the Ferro Backup System can produce a consistent backup copy of locked files even where the only alternative would be to shut the program down or turn off the service using the file. The Ferro Backup System is a data backup system based on client/server architecture, intended to make backup copies of data stored on computers connected to LAN. It is meant mainly for small and medium companies, as well as for state administration offices. October 29, 2010 - FERRO Software has released a new version of its servers, desktop and laptop backup solution - Ferro Backup System 3.4. Ferro Backup System operates within a client/server architecture and helps secure computers connected to a network. Backups may include individual files and folders or the entire hard drive In case of failure, it allows the restoration of the backed-up data and the operating system with installed software. The new version features over 40 updates and improvements. The major addition is an advanced extension of the server program functionality using scripts. This is similar to script support engines embedded in web browsers. Scripts run under the FBS Server may change the behaviour of the program itself and may also be run on the operating system's components such as: file system, register or WMI extensions. The program comes with an integrated programming environment (IDE) to edit and test the code. FBS Server supports all script languages compatible with Microsoft ActiveX Scripting technology, e.g. : Java Script, VBScript and PHP Script. Another major addition to version 3.4 is the possibility to recover data directly to the workstation. Data recovery is performed through an internal communication channel between the Server and the client using the TCP/IP protocol. As data are recovered locally by the client software, it is even possible to restore files which are currently in use. This way it is possible not only to restore the user's data but also the programs being run or the operating system's components. Other changes worth mentioning include an improved server control panel load speed, a search engine to look for files in archives, a new report offering a global view of backup tasks and a new network resources management panel. Other changes improve the operating comfort and eliminate errors detected in previous versions of the program. Bystra, February 10, 2009 - The FERRO Software company announces a new version of its software for backing up servers, office computers and laptops the Ferro Backup System. The Ferro Backup System works within the client/server architecture and enables computers connected to a computer network to be secured. Backups can cover specific files and folders or an entire hard disk. In an emergency, the program makes it possible to recover archived data as well as the entire operating system with its installed programs. In the new version, duplication to tape drives (a streamer) has been introduced. This involves copying archives from the server to another location. Up to now, the Ferro Backup System provided duplication on network disks, FTP servers and optical drives. Version 3.1 provides the added possibility of copying backups to tape drives which, despite the ever-increasing capacity of hard drives, are still commonly used in backup systems. The Ferro Backup System is compatible with all of the most popular types of tape drive: DDS, DLT, LTO. Version 3.1 also includes a number of small enhancements which increase the program's productivity and make administrators' work easier, as well as a series of improvements which eliminate bugs present in previous versions. Bystra, August 29, 2008 - FERRO Software have just released the third edition version of their backup system for servers, office computers and portable computers - Ferro Backup System. Ferro Backup System is based on client-server architecture and protects computers working in a network. Backups can include selected files and folders or entire hard disks. In the case of a failure it is possible to restore backed up information or the entire operating system including installed applications. The new version features a module creating reports and statistics, which makes the monitoring of backup operations easier. Available reports include reports on the overall current backup situation, reports on missed and delayed backup tasks and statistics on backup speeds and sizes for individual computers. All reports can be viewed from the new control console, sent to designated email address or uploaded to a web server. Ferro Backup System 3 also supports backups from FTP servers and backups to optical media: CD, DVD, Blu-Ray and HD-DVD. In addition to software improvements, several changes have been made to the license agreement. Starting from version 3.0 an unregistered copy can be used to back up two computers rather than just one like previously. In addition, non-commercial use of the unregistered version is free. Bystra, May 14, 2008 - FERRO Software have just released a new version of their backup system - Ferro Backup System. Ferro Backup System is a backup system based on client-server architecture, used to create backups of information from office computers, portable computers and servers working under Windows, NetWare and Linux. It is suitable both for small office and large corporations and institutions. Version 2.9 features optimized ZIP file handling, which doubles the speed of the most time-consuming operations involving the preparation of backup tasks and viewing and restoring backup archives. Several issues detected in the previous versions have been fixed and new features enhancing the software's functionality have been added. 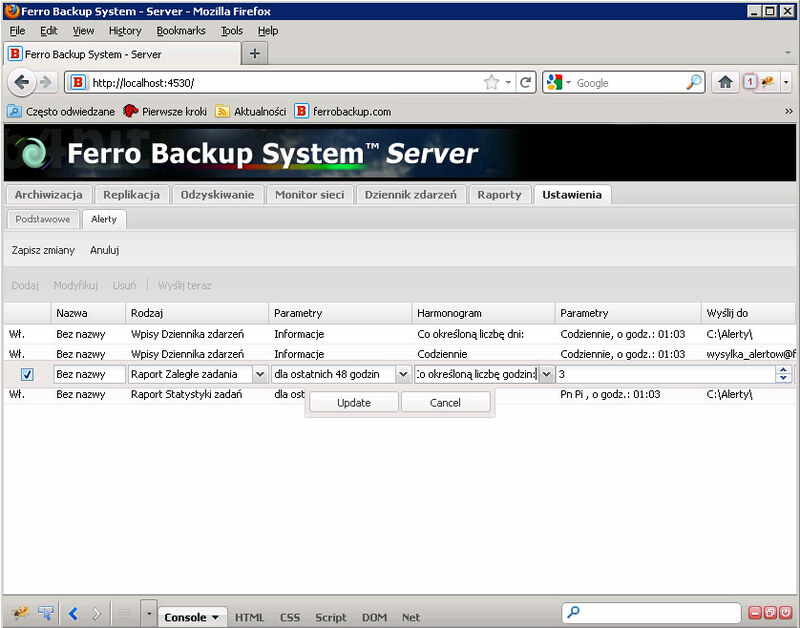 At www.ferrobackup.com you can read about the new features to be incorporated in the third version of Ferro Backup System, which is scheduled to come out in July 2009. The major improvements include: The major improvements include: direct restore to workstations, reports, support for optical media writers and tape drives. If you buy Ferro Backup System V2.9, you will receive a free upgrade to V3.x. Bielsko-Biala, May 18, 2006 - It's our pleasure to inform, that "HELP" Publishing house released a new book by Bogdan Krzymowski entitled "Computer does not work! How to recover lost data and reactivate Windows." The book describes widely concerned subject of computer data security. Author, using user-friendly style shows to reader many threats, which could have led to data loss, ways to protect against them, then if a damage happen how to recover lost data. Chapter 4.4 "Data backup copy" has been etirely focused on data backup system Ferro Backup System: "Although the name sounds unfamiliar it's a polish programe, and to be honest it's a system designed to make computer data archives & backups based on client - server architecture. It means that the programe can be used in computer networks of different sizes ..."
We join to author's appeal: "Be smart before damage! ", we invite to a lecture and to systematic making of data backup copies. Bielsko-Biala, September 7, 2005 - The FERRO Software group informed about releasing a new version of data backup system - Ferro Backup System 2.4. Ferro Backup System 2.4 includes two brand new features which are designed for more advanced users. The first one allows the archivization of opened files, meaning these, which are blocked by other processes currently working in system. During tradicional (usual) archivization the blocked files are ignored. Thus the file backup copies may not contain important data. The most usual blocked files are database and system files. The newest Ferro Backup System offers data backup of each and every kind of file, including the blocked ones. Another newest feature is the encryption of archived data. There are three currently considered as the best encryption algorithms available: Rijndael, Serpent, Twofish. Similar as during compression, the encryption is realised through computer side, on which the files resides. It means the backup copies are protected even during their transmission through network. It's important because wireless WLAN networks are used more and more often. It's well known that wireless networks are less secure than cable. The encryption method used in the newest app version makes reading the archive data impossible for hackers. An update for the application for registered users of ealier editions is free of costs. Bielsko-Biala, August 31, 2005 - The FERRO Software group informed about testing the newest version data backup system - Ferro Backup System 2.4. Ferro Backup System 2.4 is to be released in september. It will include two features which so far are met only in rare, external archivization systems. Bielsko-Biala, July 15, 2005 - The FERRO Software group informed about releasing the Ferro Backup System 2.2 - data archivization system designed to protect the computers connected to LAN network. In this new version the system has been suited to work on PCs with active Terminal Services, what improved stability of administrative module. The new operation has been provided - "Backup all", which makes immediate backup of all PCs connected to LAN. There has also been added an algorithm detecting network failures and informing the administrator about major loss of data transmission speeds. Ferro Backup System is a polish product created mainly for polish companies, in which very often are yet used PCs of mid 90s. The system is unique for its very small needs either of operating system or hardware. Administrative module does not require very expensive server operating system nor tape drives. Whereas client side software installed on PCs designed to archivization (office PCs, notebooks, file servers) require only the PC with 486 DX processor, 12 MB of RAM and Windows 95 operating system. Bystra, June, 6 2005 - The FERRO Software group informed about instant work on version 2.2 data backup system - Ferro Backup System. The works mainly are concentrated on increasing application stability and working speed. Version 2.2 is not expected to provide many major functions. But one of the new things will be an operation "Backup all" allowing immediate (one click) backup of all PCs connected to LAN. Main works are also focused on suiting the system to work with Windows Server 2003, Windows XP, Windows 2000 oraz Windows NT 4.0 Terminal Server Edition systems with active services like Terminal Service. An update for the version 2.2 of the application for registered users of ealier editions is free of costs. Ferro Backup System™ 2.1.5 offers new, expanded functions and easy data backup ability. Bystra, March, 21 2005 - The FERRO Software group released version 2.1.5 of Ferro Backup System, thanks whom in an easy way importand data in a company can be protected. Ferro Backup System is a data archivization system that works in a client-server architecture, designed to make files backup stored in office PCs, mobile PCs and servers working under Windows, NetWare and Linux. The system is proper either for small offices or large concerns and corporations. The new version of Ferro Backup System 2.1.5 was widely remodernized. Added: Rotation copies possibility and automatic hdd space freeing option. It, along with the new alerts module sending infos (e-mails) to administrator about possible dangers, frees the administrator from instant monitoring over the archivization process. Thanks to the new Connection-Cache function, which buffors the process of sending data to server and improvement of a search-file algorythm, achieved huge increase of backup speed in the same time with decreasing network overloading. The new version serves bigger comfort in work by adding an option which allows setting maximum processor usage by an application. Archivization process is now entirely invisible for common user. Increase of quality using the app can be felt also by administrator. It's because in the new version the refresh speed of remote PC's folders-tree was also increased. There's also a cute function allowing immediate cancellation of current archivization tasks. Even though many new options were added, thanks to major code optimalization, the software size installed on workstations was able to become very small (115 KB). Thanks to this, the Ferro Backup System now can easily be used also to archivize data from older PCs working under, still very popular in polsh firms, Windows 95 system.